Hey, you! 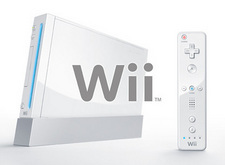 Want a Wii, for Frii? Sure you do! We're giving one away! Wiiiiiiiiiiiiii! But we are making you work for it. All you need to do is go fill out the following survey, here. Once you have completed it, shoot an e-mail to contests@gizmodo.com with Survey Giveaway in the subject. We will also be checking the e-mail entries against the surveys filled out and if you are found to be cheating we will force you to buy us a Wii (there are a few of you already trying to cheat us by just sending the e-mail and not completing the survey—we will be expecting our Wiis soon).